It occurred to me this morning that I left out something in my last post. I forgot to mention the delay between doll wiggery, and doll wardrobe. My dear, long-suffering husband! I like to modestly claim that he owes his great patience to me. I not only set the example myself, but I make it a point to try his, regularly. 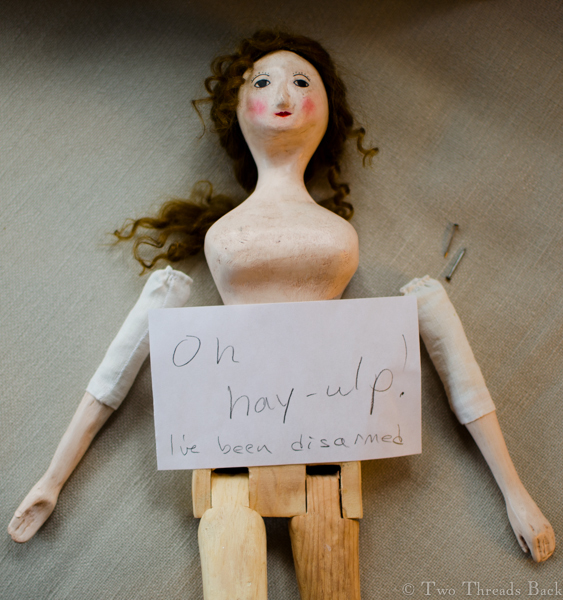 Pharaby was all ready to dress, except for attaching the arms. I knew if I made that simple little hammer tap through the layers of linen and reinforcing leather, I’d mess it up. So I wanted him to do it. I made the request, a time or two, and waited. And waited. After a couple weeks I thought it was time for another delicate reminder. I know he is very fond of dangerous metal things that make loud noises. So I tried a new approach, thinking it would have particular appeal, especially if spoken with a charming southern drawl. This entry was posted in 18th Century, Dolls, Pharaby and tagged Pharaby, Queen Anne Dolls, Wooden Dolls. Bookmark the permalink.